Main coarse, serves 4, approx. 30 min. Salmon in the oven with tomatoes and onion. Unbelievably fast, simple and good is this exciting salmon dish that more or less takes care of itself. 2. Cut large tomatoes into coarse pieces, for example, if you use cherry tomatoes, they stay in one piece. Peel the onion and cut it into coarse pieces. Chop the garlic roughly. 3. Distribute everything in an oven-proof form, add oil, vinegar and season with 1 teaspoon of salt and half the amount of black pepper. 4. Roast in the middle of the oven for 10 minutes. 5. Cut the salmon into 4 portions and season with the remaining amount of salt and black pepper. 6. 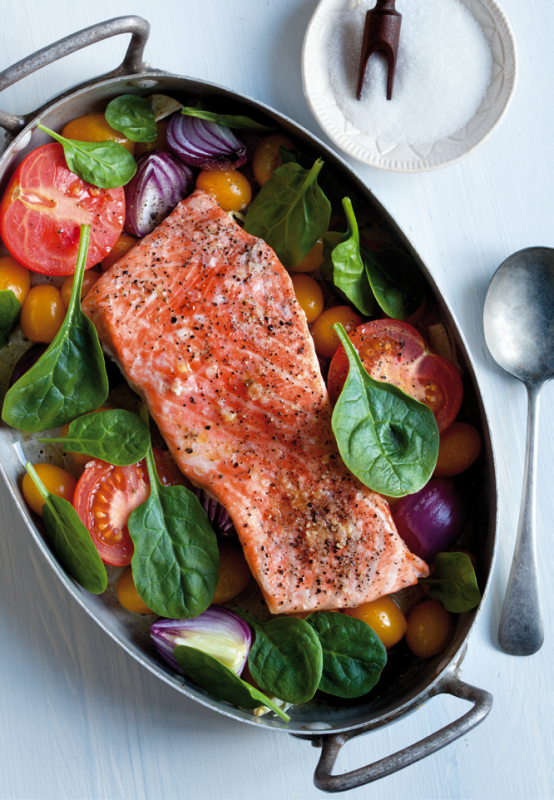 Place the salmon in the oven form with the tomatoes and onion, and allow to roast for another 10-12 minutes or until the salmon is cooked. 7. Sprinkle over leaf spinach and serve with rice, couscous or boiled potatoes. Some fat, natural yoghurt on top also tastes good.